You are browsing the archive for 2008 September. PCOer Will “Wilbur” Dawbarn is to appear on football show Off The Bar on Sky Sports 3 tonight, as an on-the-spot cartoonist. Talking about yesterday’s recording of the show, Will told the Bloghorn: “It was a really fun afternoon, I loved it. I got a bit of abuse from the host for being a Liverpool fan, but I managed to put my topical knowledge of Stoke City’s lethal throw-in secret weapon to some use on the show. “My knowledge of the game wasn’t put to too taxing a test, most of the chat was left to the pundits. It was a tricky gig – I only had about 20 minutes to think up and draw gags about what they were saying, so I had to listen, brainstorm, and draw, all at the same time. Quite a challenge, but one I’m glad I took up. Bloghorn says: the boy done good. Off The Bar is on Sky Sports 3 tonight at 9pm, with repeats at various times. Three: Tim Sanders in The Independent: Just say cheese! Thanks to the ever-vigilant Mike Lynch for spotting this one. The National Campaign for Drawing‘s annual event, The Big Draw, is upon us again. And PCO members will be working at this weekend’s opening events for the month-long festival. Much of this weekend’s activity will be taking place at University College in central London (UCL). There is an enormous range of activity for the opening weekend. You can find details on how to get there here. The event cartoonists be drawing cartoons on digital tablets and projecting the resulting film of their work onto walls and large screens. We will be running hourly cartoon master classes – on the hour – from 11am. And when the cartoonists aren’t talking, or drawing, we will be encouraging visitors, of all ages, to have a go too. In fact, we will be encouraging visitors to help invent a monster each. These will be turned into an ongoing slide show through the day as the gallery develops. 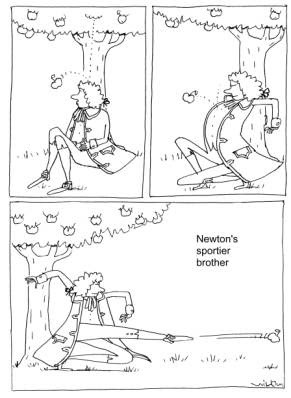 We are really looking forward to a jam packed day of all kinds of drawing and are thrilled that cartoonist Patrick Blower, one of UCL’s illustrious alumni, will be taking such a prominent position. 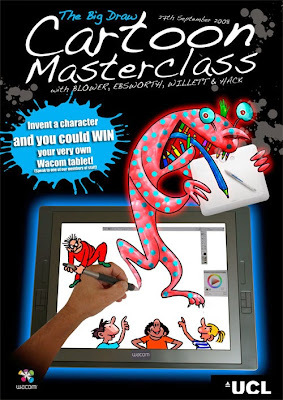 His cartooning master classes will definitely be a real highlight for children and adults alike. There are many hundreds of local events in towns across the country too. There will be one going on near you and you can find it on this page. London will also host another large set-piece event at London’s St Pancras station during mid-October – it’s called Transports of Delight. There will be further PCO participation in the battle of the cartoonists on Saturday October 18th. We will be writing more about that event in the next few weeks. Harrods is hosting Comic Timing, an exhibition of original British comic art encompassing a comprehensive slice through the British comic scene, from early Dennis the Menace and Oor Willie through to the likes of Watchmen and Viz. The show features artwork from comics as diverse as Jackie, Commando and 2000AD and by artists including Jamie Hewlett, Raymond Briggs and Posy Simmonds. Watchmen, Judge Dredd, The Bash Street Kids, Dennis The Menace (1950s) Korky The Kat (1930s), Oor Wullie (1940s), Batman: The Killing Joke, V For Vendetta, From Hell, Tamara Drewe, Petra Etcetera, Commando, Finbar Saunders And His Double Entendres, Tank Girl, Tale Of One Bad Rat, Mauretania, Captain Britain, Phonogram, Breakfast After Noon, Slaine, Robusters, Summer Of Love, Four Feet From A Rat, Rhapsody Of Love, All Star Superman, The Filth, Hellblazer, Nellyphant, Face Ache, Jackie, Commando, Gentleman Jim, Look-In, Cherubs, Judge Death, Jack Staff, Books Of Magic, Superfly, Goddess, Wired World, and Charley’s War. The Harrods website, sadly, lacks any information about the exhibition – although it does manage to mention a talk by V for Vendetta artist David Lloyd on September 29 at the Harrods Theatre. Comic Timing is located at Harrods [map], 87-135 Brompton Road, Knightsbridge, London SW1X 7XL, in the Lower Ground Floor and is directly down the stairs from Door Five, by the Knightsbridge Tube exit. It runs until October 31 and is free! What struck me almost immediately about him is how charming and mild mannered this notoriously vicious caricaturist is . He admitted during his talk that he uses drawing as a therapy. He says he feels positively ill unless he draws everyday – much like Quentin Blake. He obviously loses his anger and frustrations during the process. He outlined the drawing process he uses – he never pre-draws in pencil (to keep the artwork “alive” and as fresh as possible) and pointed out with a great flourish of his outstretched arm, that he doesn’t draw with a constrained hand or by using his wrist but with fast and furious arm movements – he “draws from the shoulder”. He outlined all the various illustration fields he has ploughed over the last 30 years from his famous caricature work (Sunday Times, New Yorker etc), opera designs for both scenery and costumes, animation work for Pink Floyd and his character designs for the animated Walt Disney film Hercules. I also found it very interesting that Scarfe has always been fascinated with animation claiming that it is still a greatly underrated art form which he would love to spend more time working with and developing. One image stayed with me afterwards and that was of one of his cartoons for the Sunday Times which shows George W Bush, dressed as Superman, flying over the chokingly black smoke and flames of totally destroyed Iraq, with the caption “Is it a Bird? Is it a Plane? No it’s a F***ing Disaster!” Brilliant. Sunday 21st September: Charleston Literary Festival, East Sussex: 4pm. Friday 3rd October: Warwick Words Festival – illustrated talk and book signing: 3pm. Saturday 11th October: illustrated talk at British Museum, London (The Big Draw): 1.30pm. Saturday 18th October: Cheltenham Book Festival: 10am. Monday 20th October: illustrated talk, Guildford Festival: 7.30pm. (contact venue for ticket details). Monday 27th October: illustrated talk at British Library, London: 7pm. (contact venue for ticket details). 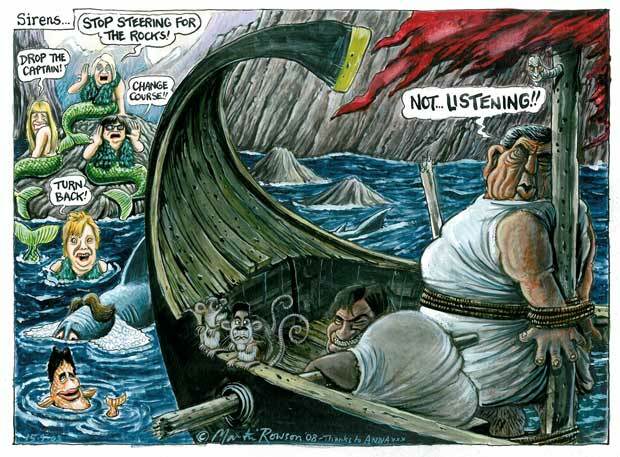 The BBC has an illustrated interview with Scarfe here. Cartoon Exhibition: Who's Laughing Now? Andy produces artwork for Rainbow Cards and much of this exhibition will highlight the gentle humour that he produces for their range. The exhibition is at the Silk Mill Museum, Derby Museum and Art gallery, from September 20 until November 2, 2008. It coincides with the Big Draw campaign which runs throughout October. Andy will be appearing at the exhibition on Saturday 4th October from 10am to 4pm where he will be running his cartooning workshops. Entrance to the exhibition and cartooning workshops is free. The opening times are: Monday 11am-5pm; Tuesday to Saturday 10am-5pm; Sunday 1pm-4pm. For further information, you can contact the Silk Mill on 01332-255 308. 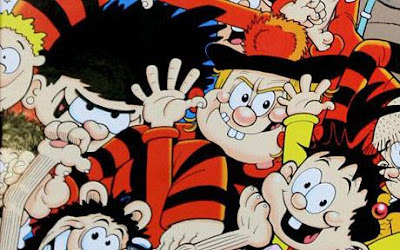 Euan Kerr, former editor of The Beano, tells the Daily Telegraph today that he was asked to tone down many characters during his time at the head of the comic. Political correctness, he says, is ruining the Beano and the Dandy. Amazingly, he had to stop Dennis the Menace’s attacks on Walter the Softy in the 1980s amid fears that they encouraged “gay bashing”. You can read the Telegraph interview here. A hat-tip for this link goes to the Forbidden Planet bog.